This winter season, my family and I immensely enjoyed a Turks and Caicos Whale Watching day trip with the gang over at Crystal Sea Adventures in Grand Turk and Salt Cay, these guys are definitely our resident “whale whisperers” right here in our islands. That time of the year again, the magnificent humpback whales! Towards the end of January to middle to end of March, these graceful giants are heading south, coming from as far away as Iceland and Greenland, to breed and nurse their young in the Silver Banks off the Dominican Republic and the Turks & Caicos Islands. They actually can be spotted (and heard!) all over the Turks and Caicos, as far away as West Caicos and even right off Grace Bay Beach beyond the reef. They are a common site for scuba divers, snorkelers and fishermen. Some expectant mother whales even give birth a bit early, giving whale watchers a special treat of seeing mother and calf together in our waters. The whales that grace the warm blue waters around Salt Cay and Grand Turk are part of the four thousand strong North Atlantic Herd who spend their summers feeding in the nutrient rich waters from Cape Cod to the Bay of Fundy. 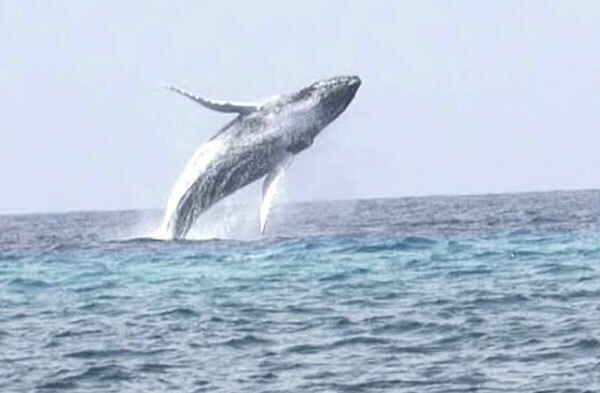 The whales then migrate south to spend the winter in the warm tropical waters between the Turks Islands and the Silver Banks north of the Dominican Republic. 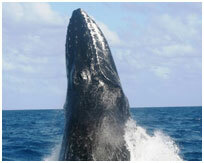 The female humpback whale is the largest in the species ranging in length from 40-45 feet long. The male grows to between 36-41 feet long. Humpback calves are born 6-10 ft. long and weigh 1000 lbs. They feed three times daily consuming 80 gallons of their mother’s milk. The humpback whale song, considered to be one of the most complex acoustic displays in nature, can often be heard while diving or snorkeling during the winter months on Salt Cay. Only males sing, and they sing mainly in the winter breeding grounds. Researchers used to think they sang to attract females, but they now believe the songs simply attract other males in a kind of social interaction. 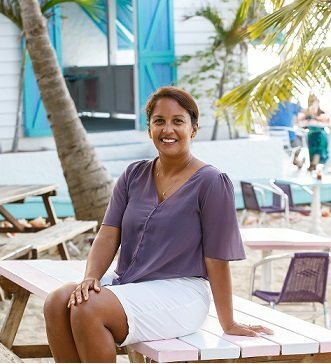 “Should I FLY TO GRAND TURK OR SALT CAY to do my whale watching tour?” — Good question, glad you asked! If you head to Grand Turk, you can walk around town, check out the museum for a bit and the historic downtown area, pop by the cruise ship terminal, checkout the lighthouse.. chances are you’ll get picked up for your tour by Sand Bar restaurant or somewhere near. 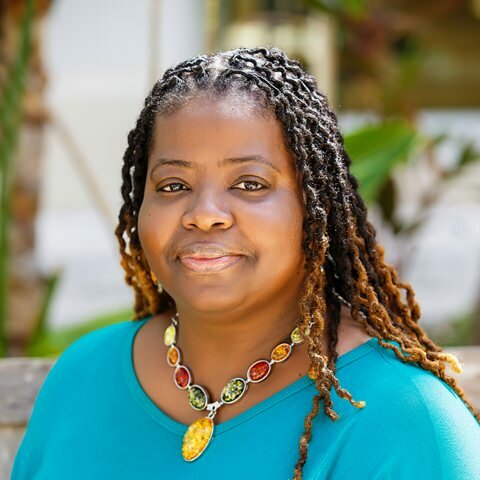 Spend the afternoon free to snorkel Salt Cay’s beautiful North Beach, or if whale watching in Grand Turk, spend the remainder of the afternoon on your own exploring historic Grand Turk. 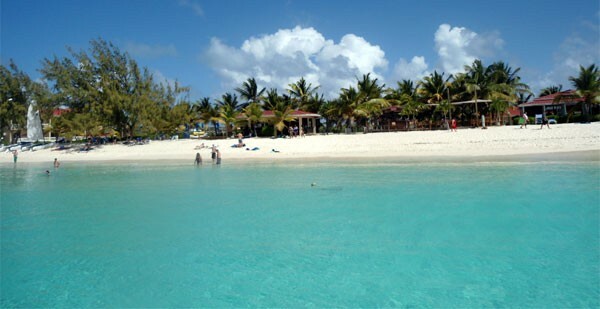 The Sand Bar is walking distance to the Turks and Caicos National Museum, shopping, or just chilling on the beach! Before going out on our whale watching excursion, we wanted to snorkel the wall – just a VERY short boat ride from the shore at The Sand Bar beachfront restaurant right on the historic downtown core of Grant Turk. Visibility was spectacular, and you could clearly see the difference in depth between the 30 feet of water that we were snorkeling in and where the wall starts – a dropoff to an amazing 3000 feet! 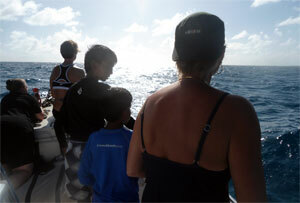 After picking up a few other fellow whale watchers from Bohio Resort, we headed out to search for the whales. After driving for about 15 minutes to a half there they were! 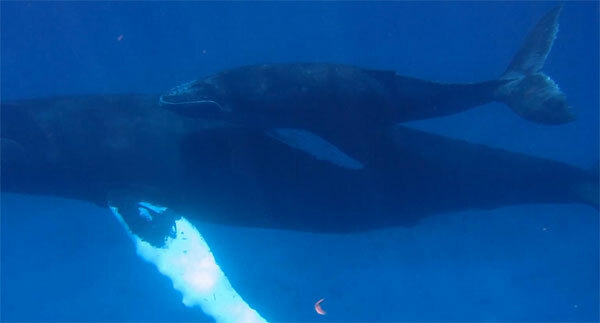 A mother and newborn calf – “just about 3 weeks old” said Tim. We followed from a safe distance for a while and looked on in utter amazement as we saw them surface, tail slap, jump, play and put in a performance for us. Everyone had their gopro cameras snapping pictures, taking video and having fun seeing these incredible creatures grace the waters. As we cruised on, we saw some other amazing sights of whales tail slapping and breaching. We followed mom and baby for 20 minutes, Tim suggested that we head to a few different spots where they’re known to hang out, so off we went to ‘the back of Salt Cay’. According to Tim, this is one of the areas that they’re seen all the time, more of a breeding ground type area. We saw even more whales. 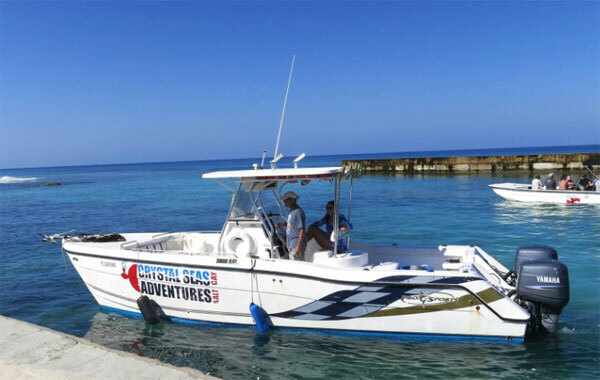 If you’re going out with Crystal Seas Adventures, their boat can comfortably handle about 8 to 10 people, they’ll have water on board and the boat has all of the proper radio and safety equipment including life jackets for everyone and snorkel equipment. Your boat captain will know the best places to go to see the whales but keep in mind that you’re not 100% guaranteed to see them! the chances are Really good though if you go for the beginning of February to mid march or so. The optimal time is second and third weeks of February. As they’re going out almost everyday to look for whales, they have a good idea of where to go, where the main breeding grounds are and a few spots behind Salt Cay. 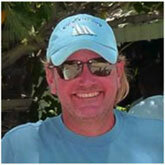 He has logged over 2000 dives in the Turks & Caicos and loves to spend the majority of his time in the water! If it be surfing, diving, snorkeling, fishing… Daniel is doing it! 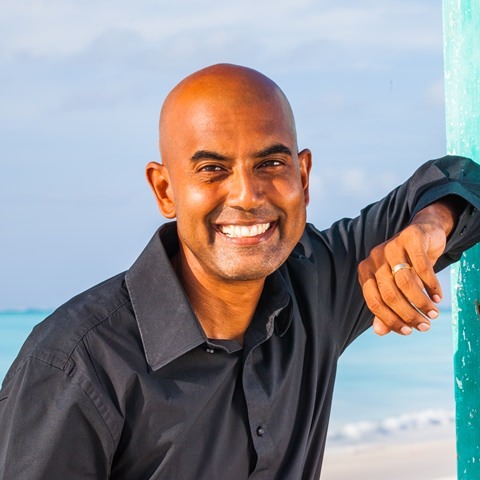 With his background being in marine biology, Daniel is very knowledgeable in fish & coral species, and is always striving to conserve the reefs of the beautiful Turks & Caicos Islands. Daniel’s goal is to make sure that when guests are on his boat, that they have an awesome time. She is a 27ft Pro Kat that is fast and comfortable. Her dual hulls keep the ride smooth and dry when single hulled boats beat and spray. With 300hp, she gets us to our destination fast. Diving from her is a pleasure, she is stable when tied to a mooring and getting back on board is easy with our strong dive ladder. This 23ft Deck-boat is a fun party cruiser. She comfortably carries a group of 12! Her open deck makes getting into & out of the water to swim or snorkel VERY easy. With a 115 hp Yamaha engine makes getting to the reef and Islands around GT fast and fun! 8 IMPORTANT TIPS TO REMEMBER IF YOU’RE CONSIDERING DOING THIS TRIP! You’ll probably be on a nine passenger plane, don’t flip out, it’s ok! Oh and by the way, when you’re leaving Provo, you’ll be able to see the entire northeastern side of the island including all the way up to North Caicos, long bay, turtle cove, and a good chunk of the Grace Bay Area. about 12 mins into the flight look to the left out the window, you’ll see a really cool blue hole in the middle of the ocean. Coming back from the open seas we stopped into Salt Cay to drop off some passengers and headed back to Grand Turk – Jacks Shack was an ideal place to come back to with the true beach bar ambiance with Bob Marley reggae, a lively and happy relaxed bunch of patrons, the smell of the jerk chicken and fish on the BBQ and one of the worlds prettiest beaches to just relax on…. We hung out for a few drinks and whisked back to the airport to catch our flight back to Provo. Whale Watching in the Turks and Caicos Islands is SPECTACULAR! Contact me to book this trip!